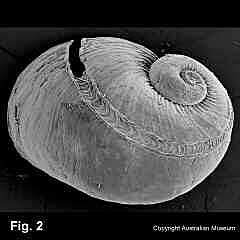 Description: Shell neritiform in shape, wider than high, spire low, aperture large. Protoconch 0.8-0.9 of whorl. 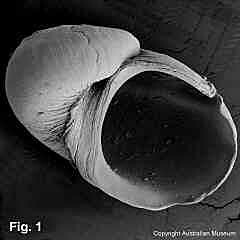 Teleoconch smooth, apart from axial threads below suture and sometimes around umbilicus. Slit at margin above periphery of whorl; selenizone behind slit, with low flanges. Umbilicus usually open, sometimes covered by inner lip of aperture, bordered with cord, interior wall making an angle with base. Operculum corneous. Shell colour white. Distribution: Endemic to Australia; Port Stephens, NSW, to south-western WA. Habitat: Known from empty beach specimens, and alive on algae down to 50 m. Moderately common. Comparison: Distinguished by the slit at the margin, neritiform shell shape and almost smooth shell. Synonymy: This was originally described as a subspecies of the New Zealand Scissurella rosea Hedley, 1904, but Geiger & Jansen (2004b) present evidence for the separation of the Australian and New Zealand populations. Scissurona vincentiana Cotton, 1945 from South Australia, is a synonym.